Despite early week falls nearly 3% was added to the carbon price last week, the high of the week (€9.36) was hit on Friday afternoon. Carbon continued its stellar start to the year, defying wider energy market woes as both coal and power suffered heavy weekly losses. Despite dropping on the day of the vote the result of the Phase IV reform package approval by the EU Parliament (see ‘Other News’) is the most obvious cause of the rise. However, with coal price declines eclipsing those of power, the clean dark spreads managed to re-coup some of the year-to-date losses, but generation margins are still languishing more than 50% lower than the end of 2017 so it’s not clear how big a contribution this is making. 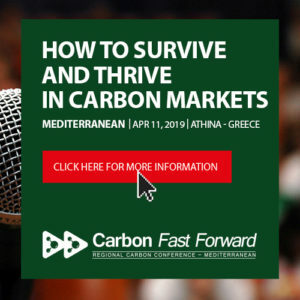 The week began with sharp falls as carbon fell to the low of the week at €8.62, but similar to recent weeks, support was found and prices reversed. This set the trend for the remainder of the week as each daily low was higher than the previous. Having tried, and ultimately failed to go lower, the bulls gained the upper hand in the second half of the week with prices clawing their way higher before accelerating on Friday. Prices hit €9.36 in early-afternoon trading but faded into the close. 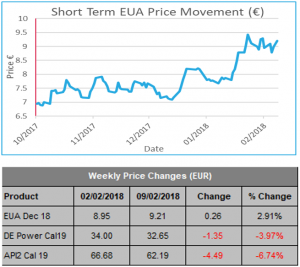 Price Impact: carbon remains locked in the recent €8.50-€9.50 range and there is little reason for it to move out of that range to the downside in the short-term. Compliance buying interest is building, the question is whether it is enough to push prices out of the recent range and for EUAs to continue their upward trajectory…. Price action last week would suggest that carbon might try to test the year-to-date high at €9.56 this week. With the bulls coming out on top last week, despite wider commodities (power, gas, coal, oil) all suffering losses, hints at increasing levels of interest from once-a-year compliance buyers. This support is likely to be strongest for the next few weeks as the first round of verifications takes place. The distribution of free allocations at the end of February may soften the impact a little and there is increased interest to sell since the market hit recent highs. The positive vote on the Phase IV reform will have been the ‘green light’ some speculators were waiting for to build long positions. However some buyers, reflecting most analysts’ 2018 forecasts that are lower than current prices, are preferring to wait in the wings for lower prices. For the week ahead, we think prices are at best supported, at worst, heading higher. We will wait to see whether the compliance buying is enough to overcome the resistance that will inevitably form around €9.56. The EU Parliament formally voted in favour of the Phase IV reform package by 535 votes to 104 with 39 abstentions. The long-running reform package is in the final procedural throws before being written into EU law with just the European Council left to adopt the package before it is published in the EU Official Journal. Neither last week’s vote nor the EC’s decision are / were expected to be anything other than a formality. The Phase IV reform sets out the rules that govern the EU ETS from 2021-2030, a major development of the ETS as free allocations are cut and the impact of the Market Stability Reserve is felt across Europe. To understand how your installation is likely to fare in Phase IV, we have analysed the impact that benchmarking, the linear reduction factor and leakage list changes will have on the free allocation to every sector covered by the EU ETS. 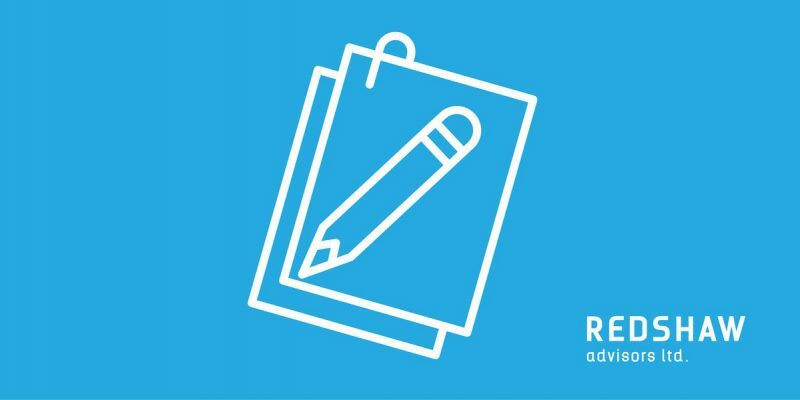 If you would like to know more, please get in touch with the Redshaw Advisors team at info@redshawadvisors.com. Conservative former environment secretary Lord Deben said it was “barmy” to walk away from Europe, as the UK would have to continue to replicate EU rules on things like emissions but without the power to shape the decisions. He said Britain had made great progress on tackling issues like water quality and emissions since joining the EU and warned that Brexit could put that record at risk. Advances have been made following legal pressure and threats of fines from Brussels. He told MPs that global businesses were unlikely to produce products specifically in line with UK regulations, if Britain opts to diverge from the EU on issues such as energy efficiency and emissions from cars.